There is something decidedly unappealing about gazing into the center of a slab of beef. It didn’t bother me to see hocks of pork bolted to a wooden bar, then sliced paper-thin, and served to me, when I was in Spain. 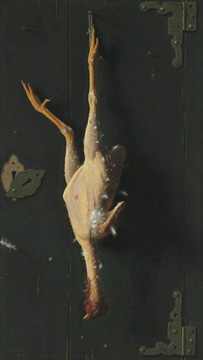 Neither did the whole chickens and rabbits hanging from hooks in the market, which I took photographs of, then framed and hung in my kitchen. I am at the Art Institute Chicago for the member lecture and preview of “Art & Appetite: American Painting, Culture and Cuisine.” Artist Date 48. It is dark and warm in the auditorium. A slide of a still life – fruit and meat – is projected on-screen. And then another, a fish. They are not beautiful. They do, however, evoke a flood of food memories. Like the time I received a whole, smoked salmon. It was my 39th birthday and I threw a big potluck soiree. The man/boy I was crushing on – but could, and would, do nothing about as I was married – was the first to RSVP, saying he would bring Tang. I laughed. Knowing him, it might have been true. The night of the party, he arrived with a box in his right hand – carrying it like a tray, high above his shoulder. His name was on the side in black magic marker. This was something he had ordered. Inside was an entire smoked salmon. Head. Tail. Everything. Glistening. Beautiful. Although not Jewish himself, he seemed to intuitively know the way to a Jewish girl’s heart was through cured fish. “He likes me,” I thought, beaming. The next morning I made scrambled eggs with onions and the leftover smoked salmon. One of my girlfriends had come to town from Los Angeles to celebrate. Over coffee, I said the words out loud. She disagreed, insisting the fish was about him and how he wanted to be perceived. That it meant nothing about me. I didn’t persist. It didn’t matter. I was married. I hadn’t thought about the fish story in a while. Or the fish guy, which my friends and I affectionately called him from then on. He moved away while I was still married — to fish. Memory wrapped in food. It seems nearly impossible to separate the two. I am reminded of this all week while leading Weight Watchers meetings and trying to encourage a conversation about what makes Thanksgiving memorable – besides food. For the most part, the members are having none of it. They want to talk about macaroni and cheese. Stuffing. Pumpkin pie and cranberries from a can. One woman mentions waking her daughters late in the evening, dressing them, and taking them shopping at midnight. I would have loved that, I think. She is creating tradition. I think about living in California and riding my bike Thanksgiving morning – before the feast at Tim’s house. I think about the printed menus Tim placed at each seat, like Martha Stewart. About roasted root vegetables and pumpkin gnocchi. I think about the year I got married and leaving for my honeymoon on Thanksgiving Day. Eating breakfast with Tim and his roommate, Steven at the International House of Pancakes near the airport. I do not mention any of this. It is their meeting. The exhibit moves from still life to real life. There are rationing cookbooks. Bright Spots For Wartime Meals – a Jello cookbook. The words, “Armed with a can opener, I become the artist-cook, the master, the creative chef,” from the Can Opener Cookbook, are stenciled on the wall. They remind me of a story I once heard about the “original foodie,” M.F.K. Fisher. Suspicious that her celebrity kept those about her in silence, she once made a meal entirely from canned foods. 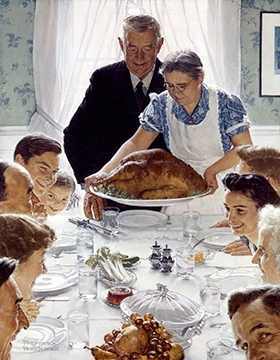 When her guests swooned, confirming her intuitions, she informed them of the origins of their dinner. 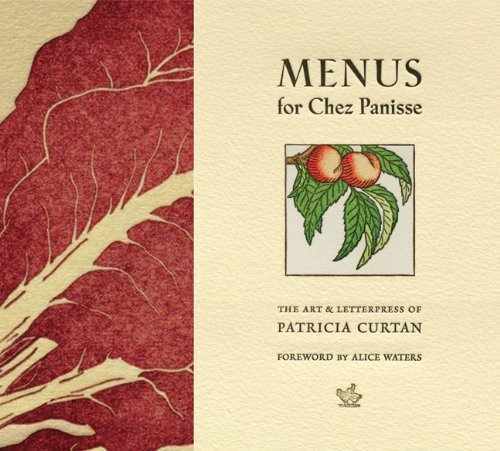 There is a menu for a meal honoring Fisher, created by Alice Waters, owner of Chez Panisse. She is the Berkeley, California chef known for purple hats, and for bringing seasonal, local ingredients – cooked simply, cooked well – back into fashion, beginning in the early 1970s. And there is a menu from Chez Panisse, celebrating Bastille Day in 1976, as well. I ate there just once. On my birthday. I do not recall which year. I saved the menus – prix fixe, with gorgeous drawings of figs on the cover – for a long time, imagining I would frame them and hang them in my kitchen one day, along with my food photographs. I never did. Strangely, I do not recall what I ate. I remember our server. And the cost of the meal for two – $300. Driving home in the first snow of the season, I chew on Brazil nuts – 30 grams of them weighed out and tucked in a small plastic container. Just a snack. I am full on memory.